Phnom Penh, 5 April, 2019. 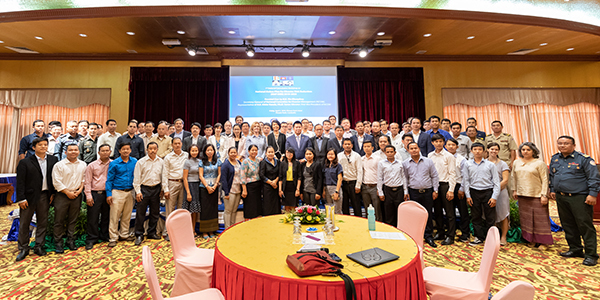 With technical assistance from the UN Development Programme (UNDP) and UN Office for Disaster Risk Reduction (UNISDR), Cambodia’s National Committee for Disaster Management has hosted its first consultative workshop towards developing a National Action Plan for Disaster Risk Reduction. Disaster risk reduction and resilience-building require strong leadership and policies to mitigate negative hazard impacts in any society. As the Royal Government of the Kingdom of Cambodia progresses from previous plans into the National Strategic Action Plan for Disaster Risk Reduction (NAP-DRR) for 2019-2023, an opportunity arises for the government and relevant stakeholders to focus on improving such governance, policies and actions. Consistent with the goals outlined in the Royal Government of Cambodia’s Rectangular Strategy IV, the new NAP-DRR 2019-2023 is expected to prioritize and articulates guidelines, references and direction for all stakeholders on the implementation of disaster risk reduction in Cambodia over the next five years. Such a plan comes at a particularly relevant point of Cambodia’s economic context, as sustainable development cannot be inextricably separated from effective disaster risk reduction. “We have learned a lot - when there are floods and other disasters, those first affected are children, those with a disability, the elderly and women. Disasters hinder our social and economic development. 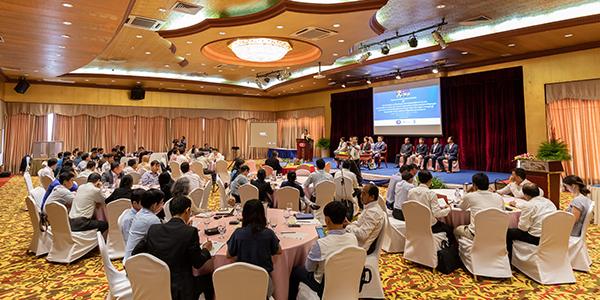 It affects the livelihoods of vulnerable people…poverty cannot be eliminated, and sustainable development cannot work without disaster risk reduction,” said His Excellency Yin Khunphoy [from the last NAP-DRR], attending the first official policy consultation event in Phnom Penh on 5 April 2019, attended also by UN Resident Coordinator in Cambodia, Ms Pauline Tamesis. The NAP-DRR 2019-2023 will articulate what and how to implement disaster risk reduction at a national level, resulting from extensive analysis of the previous plans and consultation with key stakeholders including local and national government, UN agencies, non-government organizations and technical institutions. “Cambodia is doing quite a lot and is well poised for significant disaster risk reduction. Consultation on the NAP-DRR comes at a critical time, as across the region we are seeing unprecedented disaster events”, said Head of UNISDR's Regional Office for Asia-Pacific, Mrs Loretta Hieber Girardet. The NAP-DRR 2019-2023 will supersede the government’s previous policies, NAP-DRR 2014-2018 and the Strategic National Action Plan for Disaster Risk Reduction 2008-2012. The previous plans have primarily aligned with the Hyogo Framework for Action 2005-2015. 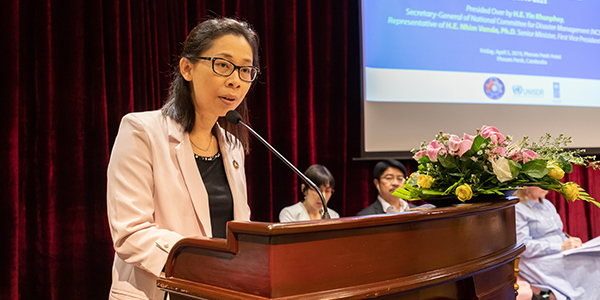 Representing UNDP Cambodia, Assistant Resident Representative Ms Rany Pen expressed her gratitude on the presence of line ministries in the process. 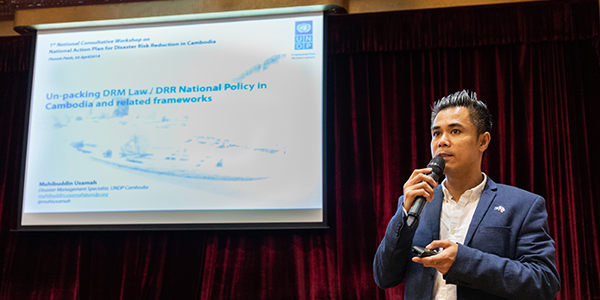 This process of NAP-DRR is linked to other UNDP-initiated activities in Cambodia, including a Post-Disaster Needs Assessment initiative that UNDP and NCDM started in 2018 as well as an early warning system project, which requires multi-sectoral intervention. The hope is that this NAP-DRR can link all the dots that could further enhance the capacities of Cambodia. A mid-term review demonstrated partial to moderate achievement on many of the NAP-DRR 2014-2018 activities and identified several recommendations moving forward including an increased focus on disaster risk reduction at sub-national level and developing improved coordination. Alignment of NAP-DRR 2014-2018 with the Sustainable Development Goals has been a specific challenge identified in a national level consultation meeting hosted by the National Committee for Disaster Management and UN Development Programme in July last year. Attending the workshop, Senior Advisor for Climate/Disaster Resilience and Recovery from UNDP's Bangkok Regional Hub, Mr Sanny Ramos Jegillos, explained that the development of the NAP-DRR 2019-2023 policy gives opportunity for strong alignment with other resilience agendas beyond the Sendai Framework for Disaster Risk Reduction (SFDRR) 2015-2030; for example, the Paris Agreement for Climate Change and Sustainable Development Goals. Such global frameworks focus less on managing disasters than their predecessors and instead emphasize reducing risk. The NAP-DRR will align not only with the various international development frameworks, but also national laws and guidelines. The upcoming NAP-DRR could be instrumental in translating the Royal Government of Cambodia’s national Disaster Management Law, promulgated in 2015 into the disaster risk reduction action plans, reflecting the interlinkages between policy and actions at the national level; further emphasized by Mr Muhibuddin Usamah, Disaster Risk Management Specialist of UNDP Cambodia. During the consultative workshop, Mr Usamah also unpacked the previous NAP DRR and various related policies including Cambodia’s Climate Change Strategic Plan (2014-2023) and Ministerial Plan on Disaster Risk Reduction and Climate Change, for example the Plan for Action for Distaster Risk Reduction in Agriculture (2014-2018) and the Ministry of Environment’s Climate Change Action Plan. As part of the recent consultative workshop, key stakeholders reflected on successes, challenges, and key lessons learned during the implementation of the previous policy. Groups discussed proposed priority actions across five areas including understanding risk, disaster risk governance, investing in/financing disaster risk reduction, enhancing preparedness and build back better, and ensuring coherence and inclusiveness. The discussion was based on the established UNISDR’s approaches and processes for developing and implementing SFDRR-aligned disaster risk reduction strategies, which was also presented by UNISDR during the consultative workshop. The event is the first of a series of consultative workshops to be held before the NAP-DRR 2019-2023 policy is expected to be endorsed and disseminated in 2019. 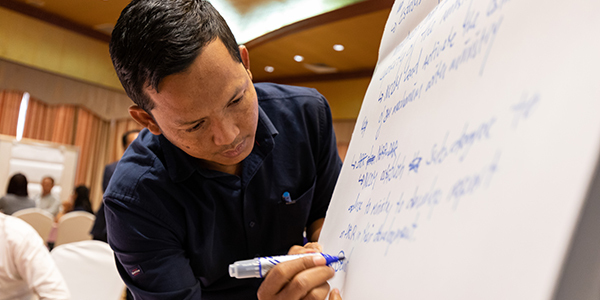 This process would also be used in refining the Standard Operational Procedure of Early Warning System in Cambodia, a parallel process led by UNDP Cambodia in Strengthening Climate Information and Early Warning System, funded by the GEF Least Developed Countries Fund. Photo captions, top to bottom: His Excellency Yin Khunphoy; UN Assistant Resident Representative Ms Rany Pen; participants; EWS Project Manager and Disaster Risk Management Specialist, UNDP Cambodia, Mr Muhibuddin Usamah; Mr Socheat So, Humanitarian Response Forum Coordinator from the World Food Programme, recording group discussion on priority actions; group photo.